"Sunsets, flowers, landscapes: these kinds of things don't move me to do anything. I just want to leave them alone. My work comes out of being frustrated about the human condition. And about how people refuse to understand other people. And about how people can be cruel to each other. It's not that I think I can change that, but it's just such a frustrating part of human history." Nauman’s pioneering explorations of sculpture, performance, sound, and video have influenced artists internationally. Throughout his extensive oeuvre spanning five decades, printmaking became a space for Nauman to test out new artistic ideas, which he later translated into different media. Featuring over 20 works from the artist’s multidisciplinary practice including collage, etchings, lithographs, screen-print, and sculpture from 1969-2007, this exhibition examines Nauman’s analysis of physicality, movement, and language. Nauman explores dualities behind an artist’s presence in his works: while he draws from the physicality of his own body, he also uses mechanical reproductions such as lithography to detach the artist’s hand. In an extended interview with art historian Christopher Cordes, he describes his fascination with the process of printmaking: ‘A clearer or more independent statement is there in the prints…a kind of tightness and clarity that I like.’ Many of Nauman’s peers hailed holography as a ground-breaking medium that transcended conventional modes of film and photography, a harbinger of virtual reality. 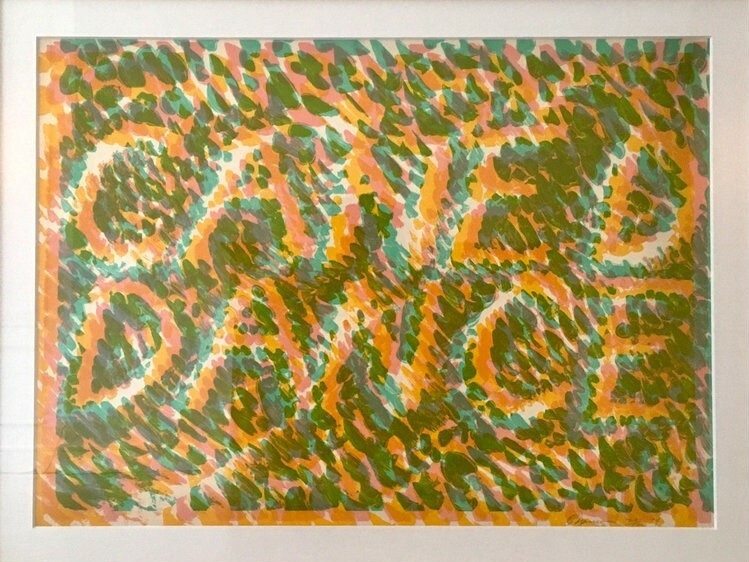 His experimental Untitled (Hologram), 1969 drew from this excitement in neon hues and repetitive body motions. Studies for Holograms, 1970 takes stills from such holographic projections where the artist laughs in the face of false promises. Studies for Holograms highlights his captivation with the ‘lost self—both physical and mental’ according to Christopher Knight of the Los Angeles Times. Nauman contorts his mouth as if to form letters and sounds, evoking memories of childhood games and play. Printed in a silvery grey halftone and an acidic yellow, the faces become disembodied, taking on an eerie quality less like flesh than malleable clay. Nauman returned to these contorted facial forms in his 2007 series, Soft Ground Etchings, reworking these same facial expressions in more welcoming tones of pastel. Life Mask and Pearl Masque, 1981 also engage with the process of lithography and the reversal of image and text that occurs through direct printing. Nauman explains his investigation of the written word: ‘When language begins to break down a little bit, it becomes exciting and communicates in the simplest way that it can function: you are forced to be aware of the sounds and the poetic parts of words.’ His work draws strongly from the philosophy of Ludwig Wittgenstein, a philosopher who asserted that ‘language [is] the mirror of the world.’ Paul Coldwell, professor at University of the Arts London, describes how ‘Bruce Nauman plays with words like a cat with a ball of wool, teasing them, unravelling them, reshaping them, separating them from their dictionary definitions.’ In each of these works, the agitated gestural marks assert that it is not a text but rather a drawing of words. Nauman (b. 1941, Fort Wayne, Indiana) has exhibited internationally for over five decades. Since his first solo gallery show in 1966, Nauman has been the subject of renowned museum exhibitions at institutions including The Whitney Museum of American Art , Los Angeles County Museum of Art, Guggenheim Museum New York, Tate Modern, and Kunsthalle Basel. Among his accolades is a Honorary Doctorate of Fine Arts from the San Francisco Art Institute (1989), the Max Beckmann Prize (1990), the Wolf Prize in Arts—Sculpture (1993), the Wexner Prize (1994), and the Golden Lion for Best Artist at the Venice Biennale (2009). The Museum of Modern Art, New York is now organizing a major Bruce Nauman retrospective in 2018, making him the first artist to have two retrospectives at MoMA in his lifetime. He currently resides in in Galisteo, New Mexico with his wife, Susan Rothenberg. For further information, please email eda@edwardressle.com or dial +1.212.641.0608. All images are subject to copyright. Gallery approval must be granted prior to reproduction.